What If Change Can Be a Good Thing? A few weeks ago I did a phone interview for an upcoming online Christian Homeschool Summit. I wasn’t very sure of myself going into it and questioned why I had actually said “yes” to the invitation. Sure I’ve been homeschooling for over 14 years. But all that’s really taught me is that I have a lot to learn. Share my knowledge with others? What knowledge?? Therefore, I decided I needed to pray before starting this interview (because I hear that works sometimes). I asked God to let the Spirit work and for my words to be from Him. Always be open to change. Just because it has worked well for your family in the past doesn’t mean it will continue to work well now. Seasons change. Family needs change. Kids get older. Commitments and ministries and obligations and activities evolve through the years. If something that has been working for you suddenly is not working – that doesn’t necessarily mean you are doing something wrong. It might simply mean that it’s time to switch things up to make them work differently. To make them work better. I very much needed to hear those words. It’s crazy how that prayer thing works. I’ve needed to embrace this truth as our kids have gotten older. My current parenting and teaching teenagers while working from home full time stage is different from my parenting and teaching little boys stage. Sometimes it feels harder. But what if it isn’t? What if it means that I’m trying to work with a system that used to work but no longer works? What if it means I need to make some adjustments? Change can be hard. But what if some of the adjustments are slight and not even as hard as I think they’ll be? And what if change doesn’t have to be hard? What if change is good? What if change brings peace? If we are truly listening to the Spirit and letting God guide us with His perfect wisdom, what do we even have to fear? Anxiety and peace cannot coexist. Do we trust God or are we relying on self? I love God so much. I love how gentle He is about drawing me back every time I slip back into worry and anxiety mode. I get so frustrated with myself because “I’ve done it again.” But God. He’s not even shaking His head at me. He’s just gently loving me as I once again surrender to seek Him better and to find confidence in His guidance. I’m taking time this summer to pray and seek God’s guidance toward any changes I need to make in how I manage my time and energy. After all, I hear that prayer thing works sometimes. Not that caterpillars aren’t adorable (and fuzzy and squishy) and a wonderful part of God’s creation, but my preference is to enjoy these creatures once they’ve made their transformation into a butterfly. What if?? What if change for you and me can be like that? What if we’re fine(ish) as we are, but God has more for us? What if He wants to transform us, leading us through changes that make our lives into something more beautiful? Cheesy illustration? Sure. But I like butterflies and the transformation they represent. I like how butterflies prove that change can be good! I recently discovered that I enjoy Grown-Up Coloring Pages. 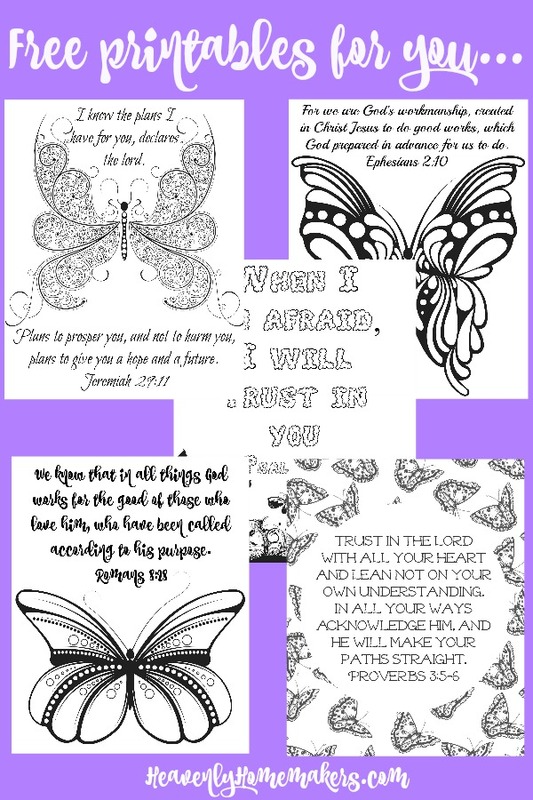 I created these butterfly-themed pages, complete with Scripture Truth about how we can completely trust God through any changes and transformations He walks us through. Help yourself! Consider these scriptures and the truth they represent about how we can and should trust our loving Father. 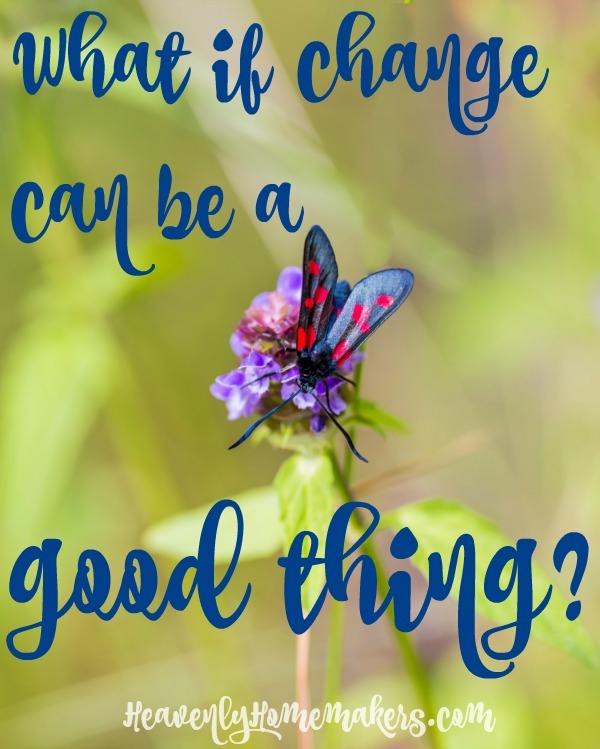 Leave a comment to share about a time you experienced a good change. Love this post- my understanding of metamorphosis is that the caterpillars actually turn to goo for a bit- haha- I think I’m in the goo stage as we’re making lots of family transitions. Thanks for the encouragement friend- hope your crew if well- looks like your boys are all so happy! Oh Laura, I needed to hear this. Thank you! I am entering into a new phase of my life and I’m struggling. After homeschooling my two sons for 21+ years, I won’t be anymore. I feel like a teenager graduating from high school who isn’t sure about his/her future and everyone keeps asking what he/she is going to do? I told my husband I want a t-shirt that says, “Please don’t ask me what I’m going to do this fall; right now I don’t know.” I try to look at the positive, like you did in your blog today, and it helps. God is good and I will be ok, but it’s hard in the process sometimes. Thanks again for your words. Have a blessed day! I love how he answered your initial prayer about the interview and I know he’ll answer the subsequent prayers about possible changes. I love that the Creator who created us is still creating us and that he even invites us to create with him. Thank you! The coloring pages are lovely, and I love the verses on them. Thanks also for the reminders about change. I usually resist change, but I need it! Also, my kids are always changing as they grow, and that is a good thing. Thank you Laura! I am so excited I could cry over these coloring pages! I could not get the recent ultimate bundle (the main reason I would have is for the coloring pages), and now I don’t have to be sad about it. :) Love the butterflies, especially as we have five chrysalides that we are awaiting God’s glory to hatch out of. Someone once told me that a caterpillar has the same DNA as a butterfly–so even when we don’t feel beautiful and life does not look beautiful, we know that the I AM says that we ARE. Beautiful, loved, and the unfinished work of His hands. I need to memorize that! Thanks for the lovely coloring pages. I’ve been wanting to buy one of those adult coloring books, but am getting a nice collection of them free for now! Two years ago I was told I was “no longer needed” as a teacher’s aide at the private Christian school had worked in for ten years. My sons also attended there for much of their elementary school years. Although it was difficult emotionally, I almost immediately knew it was God “pushing me out of the nest”. Also, although it was a wonderful and happy nest, it was a busy, non-stop, no-time-to-think-or-breathe situation for me working full-time out of the home. I mostly loved what I was doing, but was slowly shriveling up personally in a lot of ways due to the schedule. I still miss the kids, my nice co-workers, and the “prestige” (if you can call it that), of being a teacher’s aide, but have also stepped into this new world of blogging, which would never have happened if I was still there full-time. I also have much more time to think, pray, create, and pursue relationships and ministry with my slower schedule now. So I thank God for his good changes, even though it has been a time of unknowns and transition. Thankfully, he has a plan for me, and he won’t let me down!